Date: 3.05.2018 | Disco, Reggae, RnB, Breaks | Tags: Funk n Beats, The Allergies, Bomb Strikes Records, Bazza Ranks, Flevans, Voodoocuts, Soopasoul, Tim Love Lee, Continuous Dj Mix | Download Funk n' Beats Vol. 5 (Mixed by The Allergies) (2018) for free. The Funk N Beats series from Bombstrikes has reached something of a landmark with the delivery of the fifth volume. Now firmly established as a series of the highest quality, each compilation delivers in its own unique way via the guest artists involved and yet still it fits together as an overall body of work with the albums becoming something of a must have. 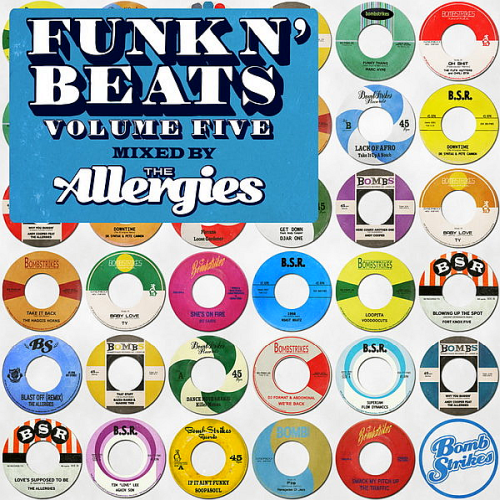 The high level of guest artists continues on this compilation, with Bristols funky beat-smiths The Allergies sitting in the curators chair and stamping their trademark style on proceedings and delivering the goods as would be expected from the mighty duo. There is plenty here for even the most educated aficionado of the scene! Once again the album contains new exclusive material nestled alongside bona fide classics and hidden gems.